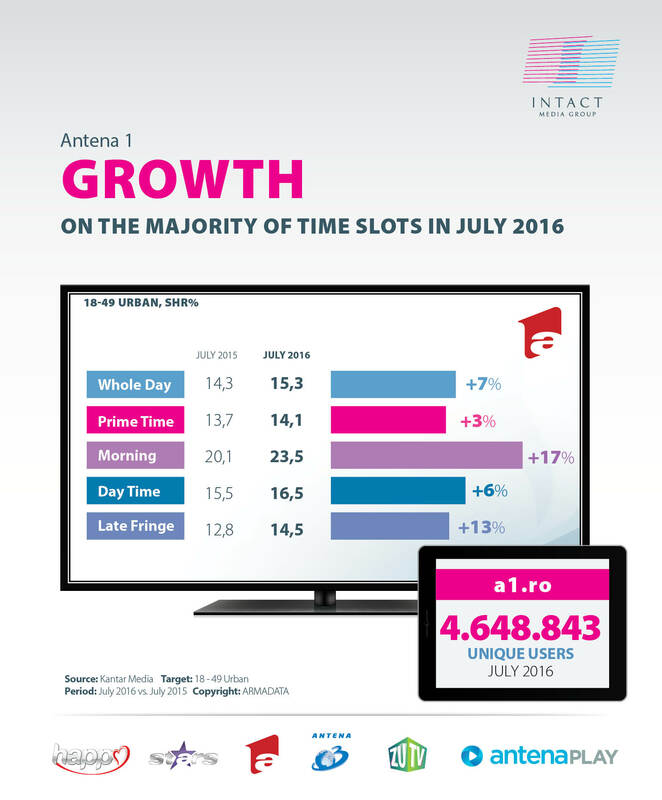 July 2016 brought audience appreciation and leadership for Intact Media Group’s TV division on important time intervals compared to the same period of last year. On the commercial target, Intact’s TV channels are leaders during Day Time and have audience appreciation during Whole Day and Morning intervals. On the urban target, Intact Media Group’s TV division leads the Whole Day, Day Time and Access intervals. 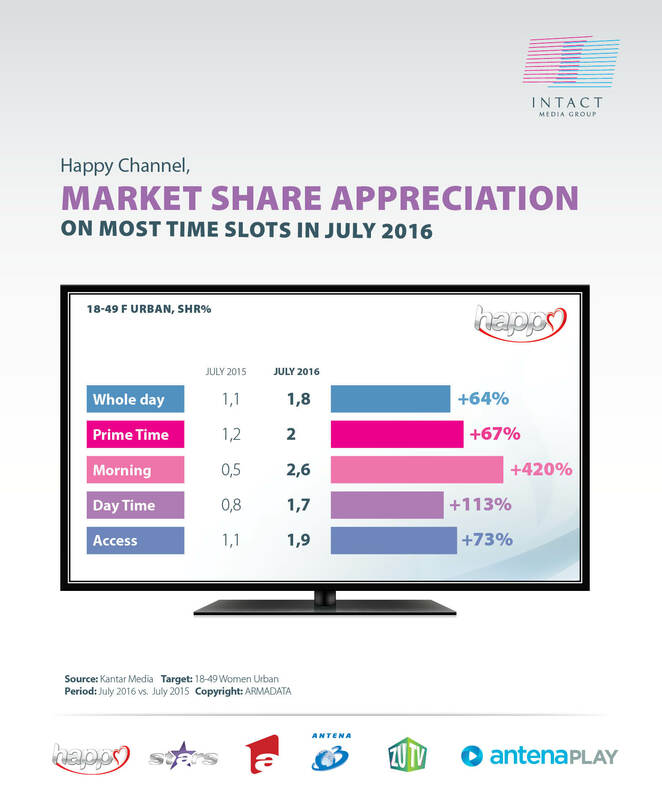 During Whole Day, Prime Time, Morning and Access, Intact’s channels show audience appreciation compared to July 2015. On the national target, Intact leads during Whole Day, Day Time and Access, with audience appreciation on four time intervals, including Whole Day and Prime Time compared to July 2015. Commercial target: has audience appreciations on most time slots, including Whole Day (+7%) and Prime Time (+3%). Antena 1 leads during Day Time (interval when May I call you mom? and Observator (news bulletin) are aired). Temptation Island, Poftiti pe la noi- Poftiti de va iubiti (You are welcome, rerun), Fantastic Show and Plasa de stele were the most watched productions in July. Temptation Island had a 14% appreciation compared to the first season. Antena 1 is the only generalist channel that had productions especially for the summer grid. All Urban target: leader during Day Time and Access , having audience appreciations on most time slots, including Whole Day ( +6%) and Prime Time ( +2%). a1.ro had over 4 million unique users in July. 18+ Urban Target: is leader of the news niche, on most time slots, including Whole Day and Prime Time. Sinteza Zilei, Exces de putere and Q&A were the most watched productions in July. 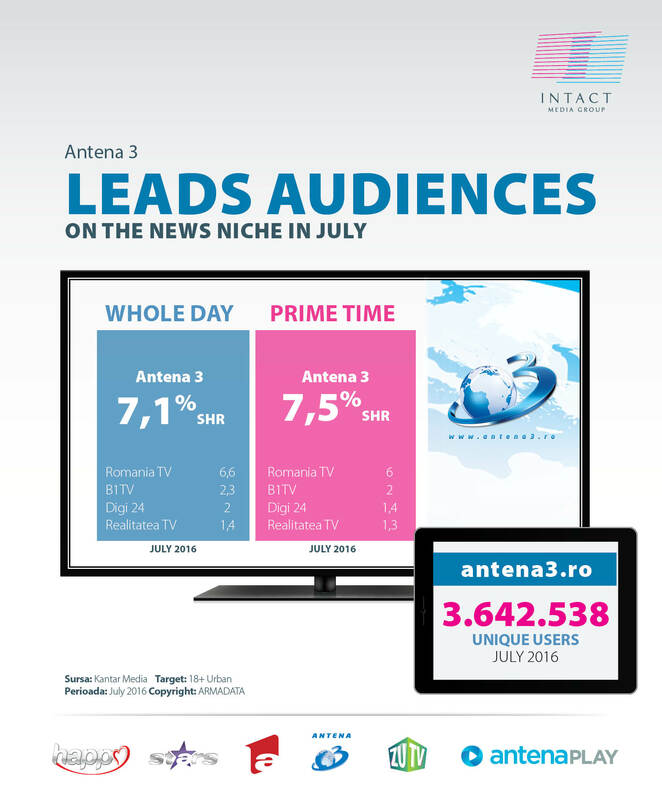 Antena3.ro had over 3.6 million unique users in July. Commercial target: Star la mare fitza, Agentul VIP and Star Matinal e pe val were the most watched productions in July. Three of the channel’s productions had significant audience appreciation compared to last year: Star News (+27%), Star Chef (+19%) and Dincolo de aparente (+4%). Commercial target, Women: had significant audience appreciations on most time slots including Whole Day (+64%) and Prime Time (+67%). Happy Channel is leader during Morning time slot, on its niche. Prizoniera dragostei (Never let go), Suits and My Corazon es tuyo were July’s most watched productions. Never let go is also audience leader on its broadcasting time, double the audience of the main competitor. 15-34 Urban population: had audience appreciations during Morning (+33%). Morning ZU, Bobiceag and the artists van and Most Wanted were the most watched productions in July. Over nine million Romanians watched Intact’s productions during Whole Day, respectively six million during Prime Time, for at least one minute, on national level.